Past dental disease and treatment is a very important and significant indicator of future dental health and disease concerns. After your dentist completes a thorough examination, they have an excellent understanding of your specific risk for future dental problems. Traditionally, a dentist would treat a cavity or a gum disease issue after it caused a problem or hurt. The standard model was to fix problems after they developed or caused symptoms. A different approach uses a risk assessment strategy. This method takes you, specifically and individually, into account during the examination process in developing a plan to maintain or improve your dental condition. When you and your dentist understand that you may be likely to have a problem develop, special efforts can be made to focus on preventing that problem or catching it at a very early stage. Just as importantly, knowing that your particular risk of developing a dental disease is very low may help avoid unnecessary dental treatment. Your dentist’s recommended treatment and preventive regimens will be based on exactly what you need—not some predetermined list that is applied to everyone. This is critical in designing dental care that will help you reduce your risk of future dental problems. In an effort to clarify where you may be most at risk, the dentist will classify your risk as low, medium or high in each of the four dental risk groups using the dots green, yellow or red. Green is Good. Red is Bad. 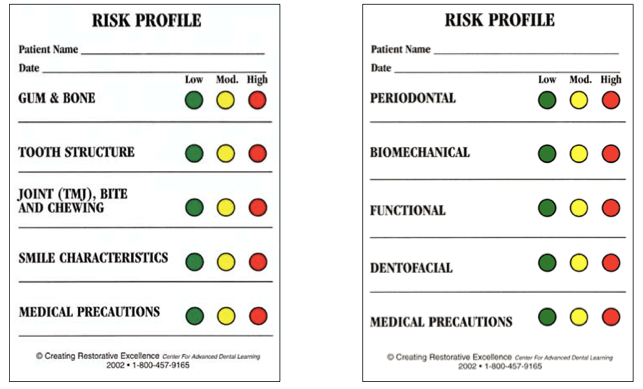 Your risk profile is actually a lifetime report card for your dental health. This is a summary of your mouth’s current condition and potential problems. Any area that does not have a green dot would be an area where you could be at risk for further problems. How does my dentist do that: reduce my risk of future problems? Your dentist will choose treatments that give you the best chance of keeping your smile, your teeth, and your oral health for your lifetime! 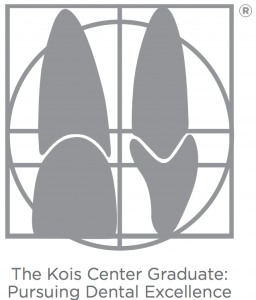 Kois Center principles teach dentists how to fix one area of your mouth without harming a different area. For example, when a Kois-trained dentist fixes your smile, they will choose a method that does not harm your gums. When your dentist thinks about risk reduction, it means they are planning for the long term—your lifetime—instead of using techniques that only help your mouth for a few years.